There’s a ton of passion needed when it comes to being a top athlete or an elite coach. Fans see the emotion when they watch the games, but the love of the game can take a turn when people lose their cool. Unfortunately, there have been incidents when something did get the better of the athlete and they threw a temper tantrum for everyone to see. Whether it’s a reaction to a call they didn’t agree with or a complete meltdown that came out of nowhere, aspiring athletes can learn a thing or two when it comes to thinking before reacting. I mean, we aren’t all crazy, right? How Much Pine Tar Is Too Much Pine Tar? 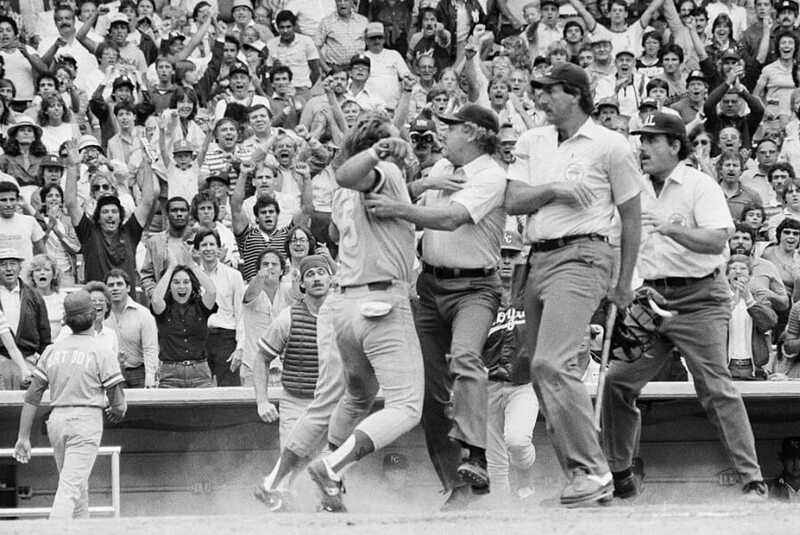 It’s a not a fond memory for Kansas City Royal great George Brett. The Hall of Famer third baseman had a home run reversed due to the amount of pine tar on his bat. Brett suddenly became a hot-head when he confronted the umpires, but the league overturned the call. 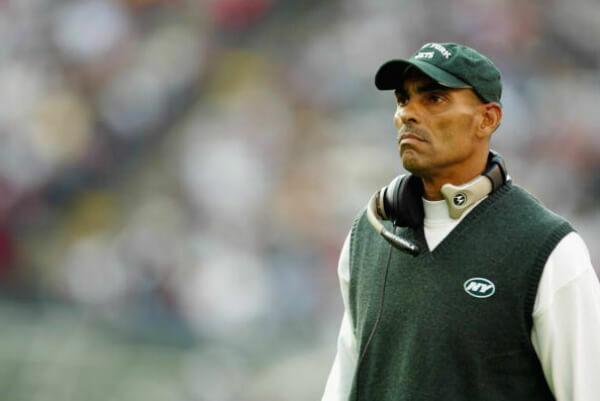 Watching Herman Edwards become a little chippy towards reporters is tantrum gold. Edwards provided a sarcastic reply when he pointed out that you play football to WIN the game. Thanks for reminding everyone what we’re supposed to do during games, Herman. Just don’t put him in the same room as Mike Singletary. When the New York Rangers and Boston Bruins squared off 1979, things got so heated that a Rangers fan hit a Bruins player in the face with a shoe. 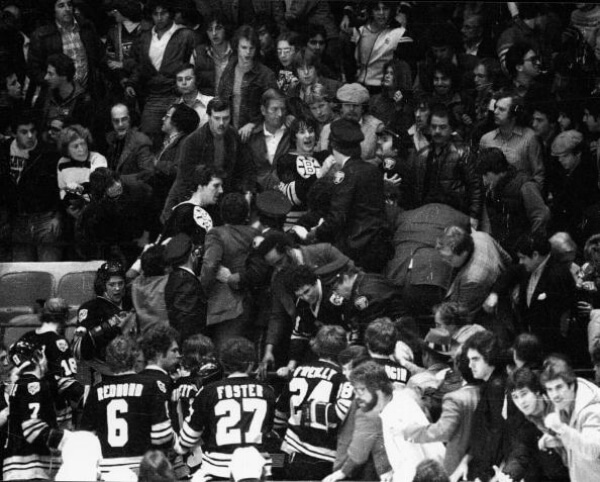 All hell broke loose seconds after which triggered Bruin Terry O’Reilly to go into the crowd to confront the fan. It’s no wonder why he’s Happy Gilmore’s favorite hockey player. One selfish play cost France a chance at winning the World Cup Final in 2006. 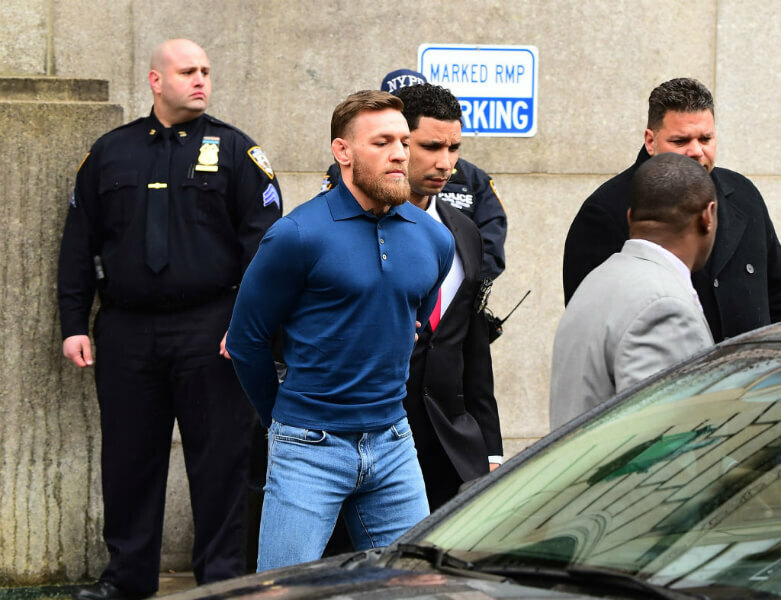 Leave it to Conor McGregor to take his bad boy reputation to new limits. The Irishman’s attitude has always been on a short fuse, but he took things too far, which cost him dearly. With a surprise appearance at UFC 223 Media Day, McGregor picked up a dolly, then threw it through the window of a bus filled with fighters. His future in UFC is in major jeopardy now. Players and officials will never see eye-to-eye. After a strike three call, Roberto Alomar certainly didn’t agree with the ups calls and let him have it. The World Series champion went face-to-face with umpire John Hirschbeck to argue the call and ultimately spat in his face. Alomar received a five-game suspension for his immaturity. That moment when Zinedine Zidane didn’t use his head-pun intended. During extra time in the 2006 World Cup Final, the French soccer legend head-butted Italian Marco Materazzi. The bad move ultimately led to Zidane’s ejection in the final soccer game of his career. Don Zimmer and Pedro Martinez weren’t the dearest of friends in 2003. In December of 1995, the Montreal Canadiens suffered a miserable 11-1 loss to the Detroit Red Wings. 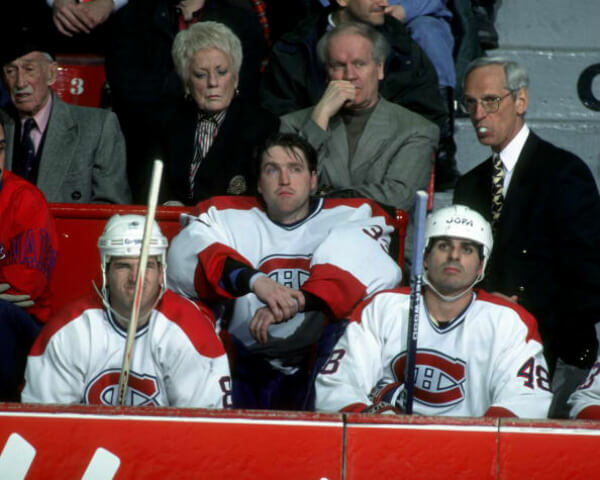 It was the last time Patrick Roy would protect the net for the Canadiens. When Roy got pulled, he went up to team president Ronald Corey and told him it was his last game in Montreal. Four days later, Roy was traded to the Colorado Avalanche. Serena Williams certainly can spell it, but it was shocking to see her throw a hissy fit. 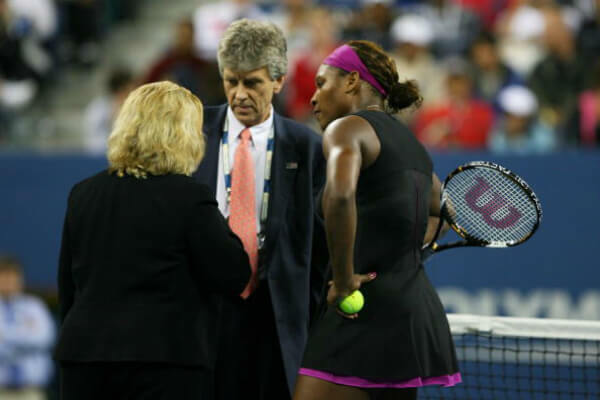 After being called for a foot fault at the 2009 U.S., Serena took it upon herself to threaten the line judge. Despite Willaims claiming she never uttered the threat, it cost her a shot at the finals as well as a $175,000 fine. Nobody knows what kind of trouble the Yankees and Red Sox will brew. 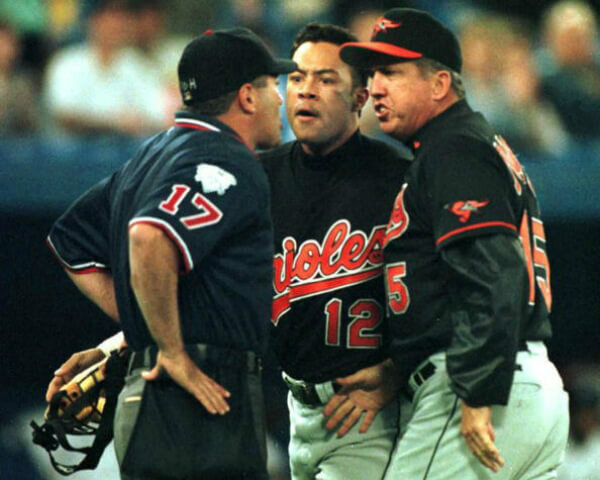 In the 2003 ALCS, things got heated between the two bitter rivals. 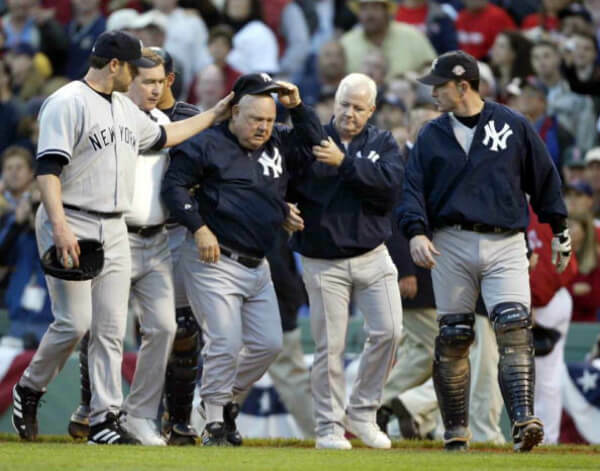 During a brawl, Yankee coach Don Zimmer rushed to the field, only to be tossed to the ground by Pedro Martinez. No suspension was handed out, but that’s an embarrassment to the game. The 2000 Fall Classic saw two players from the Mets and Yankees go behind enemy lines. This bad boy tennis star will forever be a favorite for tantrums in sports. 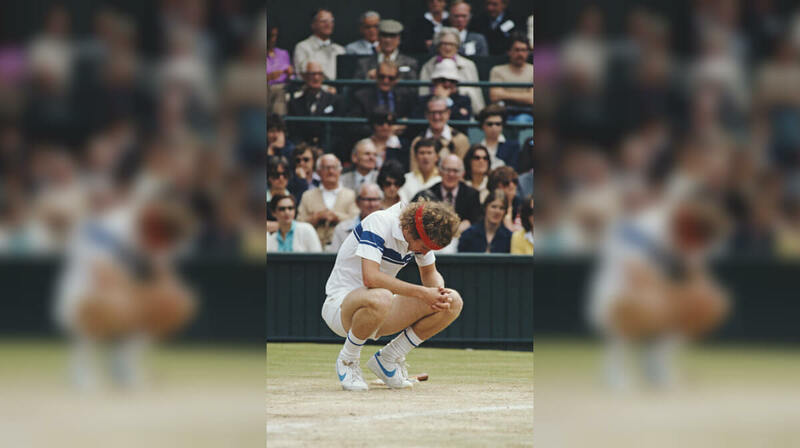 John McEnroe, who has a thing for being ill-mannered towards officials, starred in one of the most iconic moments the game has seen. His “You cannot be serious!” quote eventually ended up being of the most prominent meltdowns ever. Todd Bertuzzi got his revenge in a horrific way when he went after Steve Moore. 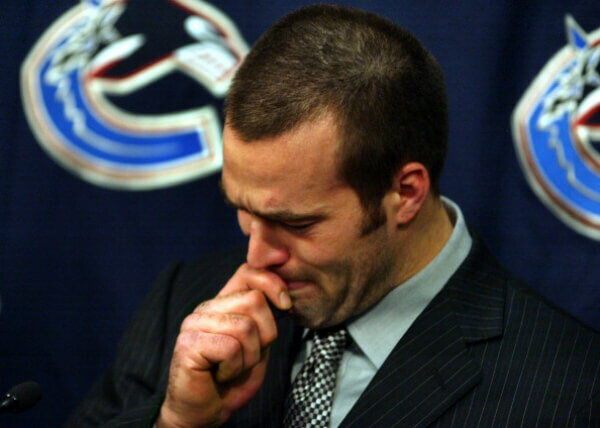 Moore gave a questionable check to Markus Naslund earlier in the season, and Bertuzzi attacked Moore as a result. The hit ended Moore’s career while Bertuzzi was suspended for the remainder of the season while also dealing with assault charges. The 2000 World Series not only showcased both New York teams, but an odd moment as well. 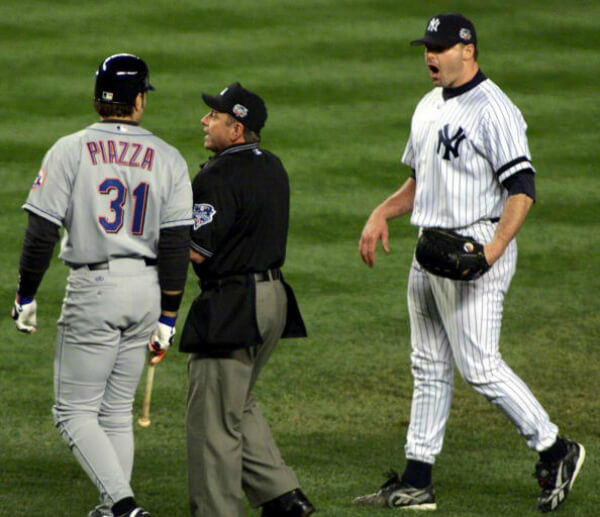 During Game 2 of the Fall Classic, Roger Clemens throw a piece of Mike Piazza’s bat in the direction of the former Mets catcher. That certainly didn’t give the Rocket a good look following the incident. 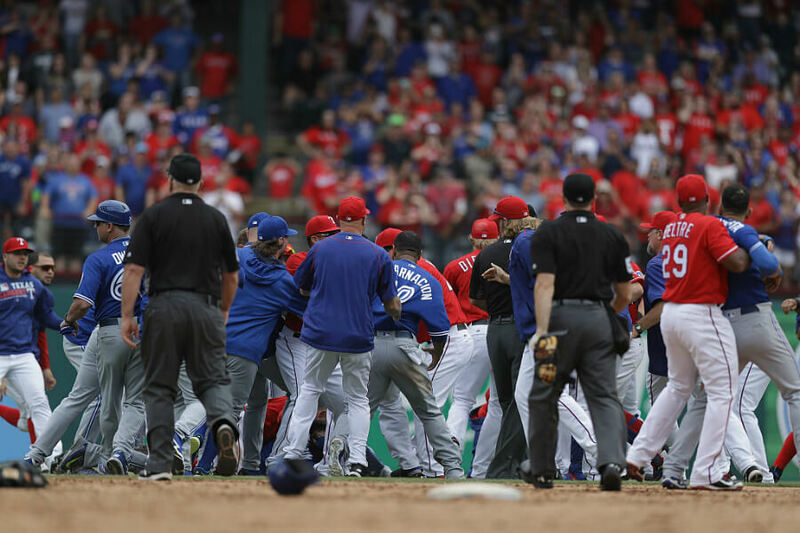 The Texas Rangers made sure to get revenge following the 2015 ALDS. The ear is not a piece of meat, and Mike Tyson doesn’t care. 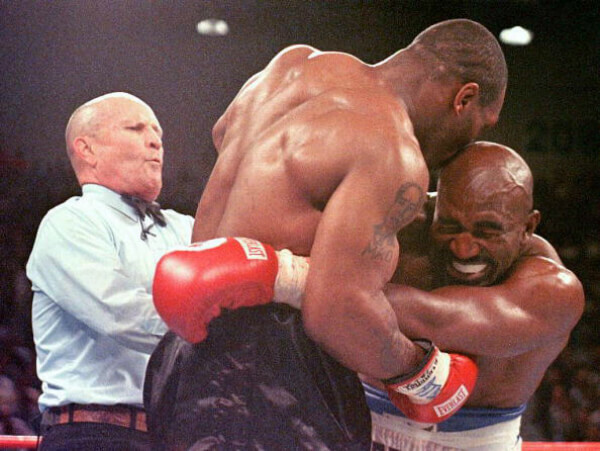 One of the most feared boxers chose to take a bite out of Evander Holyfield’s ear in 1997. The fight would be stopped at the end of the third round, and Tyson was disqualified for the controversial move. Having a broken skate lace was too much for Tonya Harding. The former figure-skating champion burst into tears and asked for a do-over at the 1994 Winter Olympics. Harding finished in eighth place while teammate and arch-rival, Nancy Kerrigan, took home the silver medal. The beef between the Toronto Blue Jays and Texas Rangers stem back to one moment — Jose Bautista’s bat flip in the 2015 ALDS. The Rangers weren’t pleased with that, and they took exception to that moment the following season. A pitch hit Bautista, but his slide into Rougned Odor is what caused the melee on the diamond. This brawl isn’t nearly as bad compared to the one in Detroit on November 19, 2004. 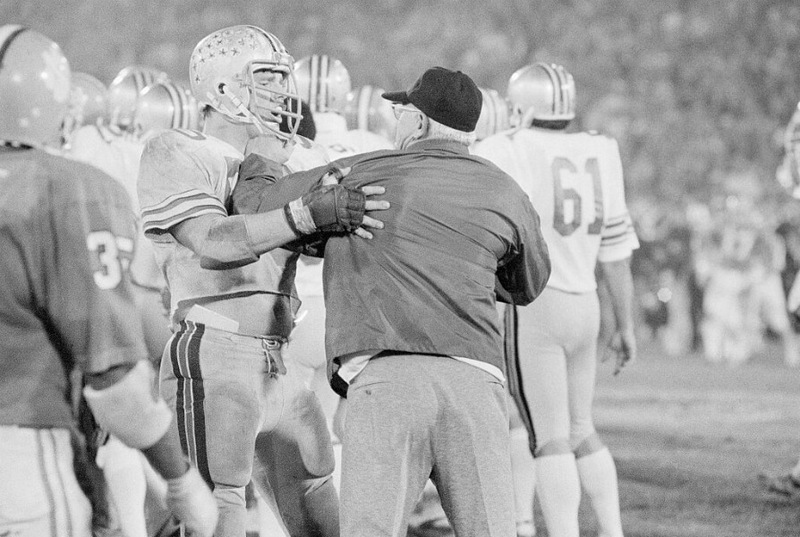 Woody Hayes was a prowling presence as the football coach for Ohio State. Hayes’ career will be remembered for his temperament, especially during the 1979 Gator Bowl. He rushed over to a Clemson player and punched him in the face. That moment would be the end of his coaching career. 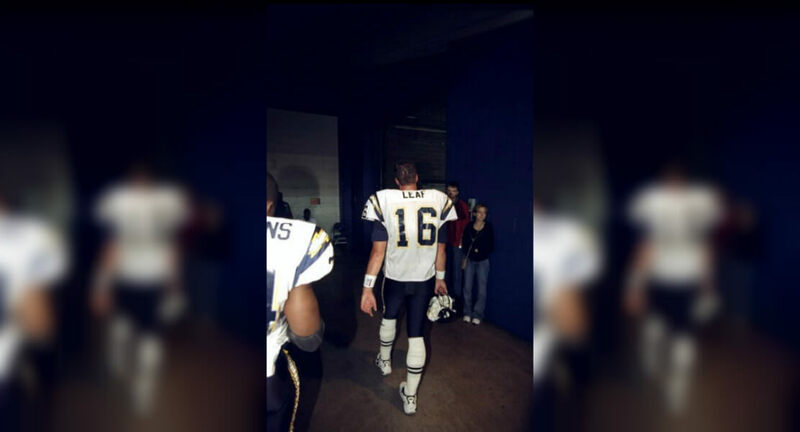 Ryan Leaf faced numerous obstacles after being drafted second overall in 1998. Leaf’s name comes to the mind of football fans as he is considered to be one of the biggest draft busts ever. After Leaf had a dispute with a cameraman, he assaulted him, and that was the beginning of the end for Leaf. Too bad he couldn’t take his talents to the CFL. This brawl will be in the minds of many basketball fans. The Malice at the Palace started out as an on-court altercation, which escalated into a serious fight between the Indiana Pacers and fans at the Palace of Auburn Hills. 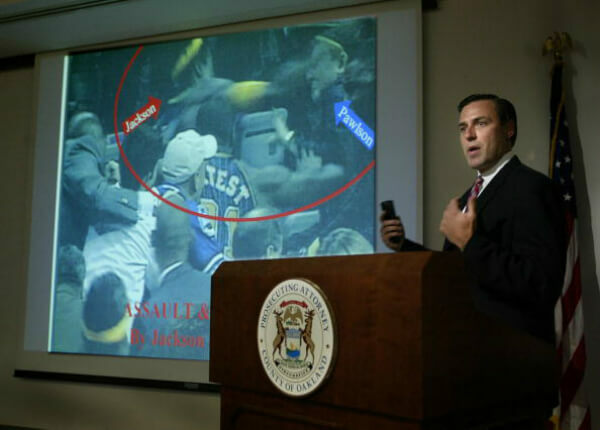 Ron Artest, Stephen Jackson, and Jermaine O’Neal all received hefty fines and suspensions after the scuffle. 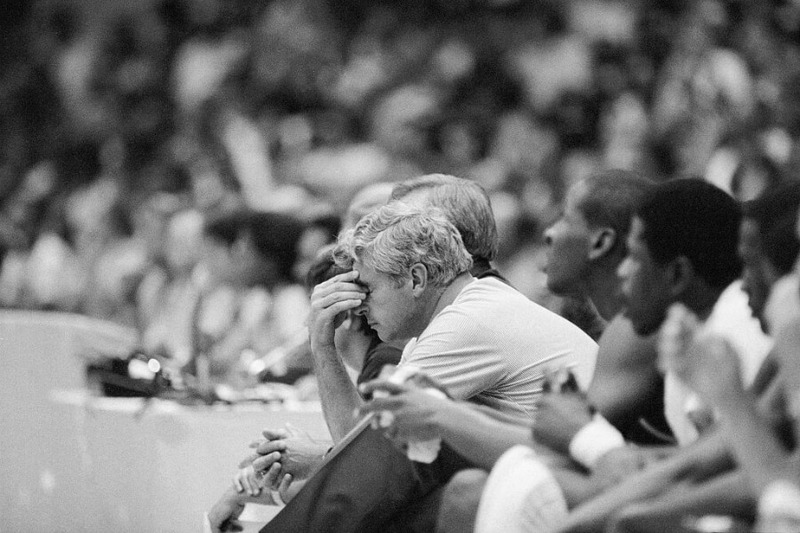 Bobby Knight was the kind of coach who would stomp up and down the court while giving it to the refs. The iconic basketball coach took it to a whole new level in 1985 when he tossed a chair across the court. That cost Knight an ejection, but his meltdowns were legendary. Odell Beckham Jr. is a particular kind of talent. Outside of breaking wide receiver records, the Giants offensive juggernaut had a meltdown of his own. After being shut down by Josh Norman, Beckham was so frustrated that he took a swing at a kicking net. 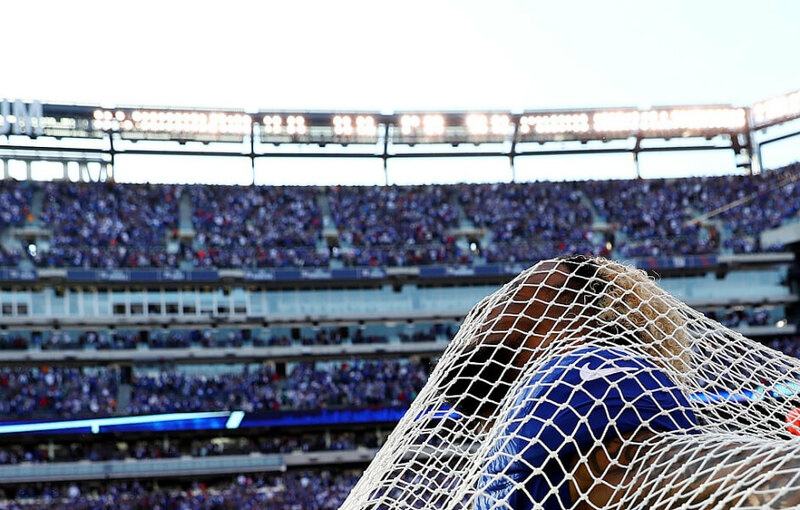 Since then, Odell made up with the net by kissing and hugging it.